Need a ideas for teaching contractions, this package contains activities, a craft, games, and practice sheets to teach contractions. Continue learning more by reading the rest of this page and you can get 2 free samples at the bottom of the page. For this activity students keep this sheet by them when they are reading. If they come across a contraction they write the contraction and its longer form on the sheet. Make it a competition. See who can find the most contractions! Word sorts are a great way to help students recognize spelling patterns. This word sort has some of the most common contractions in the english language and will help them recognize them quicker. Help student recognize common contractions and their meanings with this matching practice sheet. You don't have a spaceship? Have students convert the words in parenthesizes to contractions while reading a short little story about preparing to take a trip to outerspace. This worksheet allows students to practice making contractions in the context of actual sentences. Are you beginning a unit on contractions. You can use this contractions poster as an easy to use reference. Just click on the link to the right to download this poster. This poster is going to be a part of a unit that I'm building on teaching contractions. It will have worksheets, games, buliten board ideas, and activities to help your student learn about contractions. You can learn more about this upcoming project by Clicking on the What's New blog. This hotdog (Dachshund) contraction craft is going to be included in my contractions unit. I've made it available for a limited time free, you can download it by clicking on the link below. The idea for this craft is that you'll write the contraction on the dog, and the missing letters on the strip. 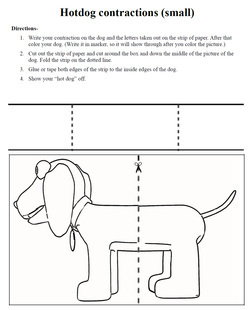 You glue the strip to the dog and when you open the dog further you see the long form of the contraction.